Is this basket CUTE or what!?! This is the new Spring Basket Template from Perfect Presentation! Leigh Ann also designed a picket fence that you can put around the entire basket for a totally different look! You can see her version of that here. I also love this basket image from Your Next Stamp! This is from the set Eggstra Special Basket, and it contains 3 stamps~the basket image, the eggs, and a sentiment which says "you're eggstra special" I think I need to make a coordinating card and include the sentiment on there : ) I added some Sage Ultra Fine Flower Soft inside the basket~but it's hard to see. I then cut out the eggs and popped them up. 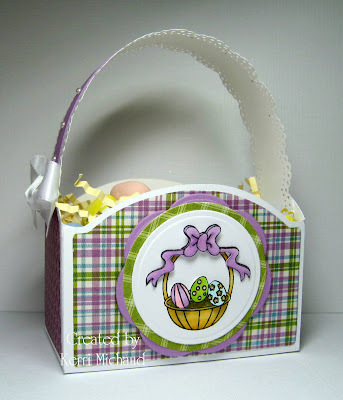 I also stamped the basket image again, and cut out the bow to give it dimension. Doesn't it fit perfectly on this darling template!? I had so much fun making this~can you tell LOL! Ok, I'm off to work on a card, but I couldn't wait to show you this basket! Have a wonderful day! Oh how cute is that!!!! I'm going to have to check out Perfect Presentation. I need to make "goodie bags" for my daughters b-day. I bet they have something I could use. WOW Kerri this is beautiful, WHAT a fabulous basket...The perfect easter colors...DARLING GF! This is the cutest basket! I love it Kerri! The popped bow and flower soft are perfect finishing touches! This looks wonderful! I actually haven't made a version without the picket fence. I will definitely have to do so now that I've seen your design! Cute basket Kerri, LOVE it! What a cute basket you created, Kerri! Fabulous! Your attention to detail is amazing! Love all the dimension and texture!